User interface: 4/5. The layout is well-spaced. It has a consistent color scheme and menus that are easy to navigate. The app is intuitive and the menus are clear. Sometimes the button presses don’t register right away. User experience: 3/5. 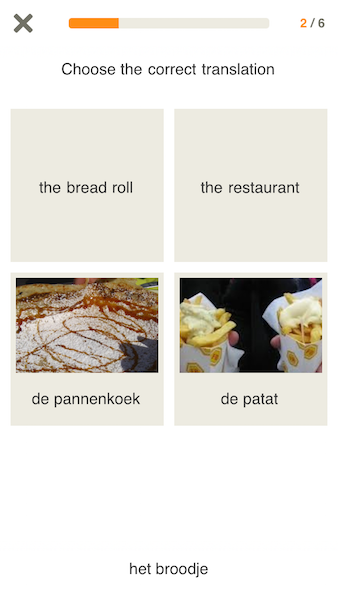 Babbel uses country-specific images to make the app more interesting. The lessons are not that much fun and start to feel repetitive. It’s not always clear how much longer a lesson will take. Learning: 4/5. Learning is structured well. You start with the basics and then learn more advanced topics. I like that there are separate vocabulary and grammar lessons. Within the lessons, there are helpful tutorials, for instance on pronunciation. Babbel requires you to read, listen, write and speak. Unfortunately the speaking function often doesn’t seem to recognize words properly. Motivation: 3/5. At the end of a lesson it tells you how many questions you got right out of the total, but there is no other scoring system. The app does not keep track of your scores, so you can’t view your progress. Feedback: 3/5. 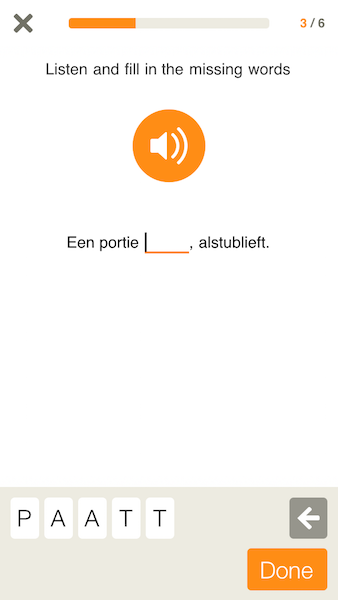 Babbel tells you answers that were incorrect and provides you with the correct answer. It would be more helpful if there were some explanations or hints. You have the ability to review questions you got wrong.